Clem E. Carrion is a unique visual artist originally from Bay Shore, Long Island, NY. Pioneering an acrylic epoxy morphing technique, he brings transparent glazing, surrealism, and contradicting textures together in beautiful one-of-a-kind works of art. Carrion's "paintings" achieve visual depth within multiple layers of translucent and transparent media that give the illusion of three dimensions. The luminescence and dramatic areas of color and light shown in the work often resonate with viewers. While living in Long Beach, California; Mayaguez, Puerto Rico; Miami, Florida; and now in Kissimmee, Florida, Carrion's work progressed to capture tropical expression without using traditional tropical themes. While traveling, Carrion took note of the colors, the ocean, the formation of rocks, their texture, and especially the various knots in indigenous wood grains. Carrion credits his father for his love for and talent in the arts. "My father loved to paint murals of idyllic and paradisaic scenes. His work left a lasting impression on me. I like to think this is where I got most of my talent," said Carrion. The various media used in his work also gets a lot of attention. Concrete, epoxy, metal infused paint, acrylic, wood, and other exotic materials seem to connect with collectors who invariably attempt to figure out how each piece was made. Carrion attempts to create movement or what he calls "Art in Motion" and what has been described as the "WOW" factor into each piece. Carrion attended mixed media school "Faux Effects" in Southeast Florida. The intensive training helped him craft his style and differentiate his work in the fine art space. He learned hue and color pallet techniques normally reserved for industrial applications. Through further training, Carrion perfected methods that allowed him to make concrete look like wood grain planks as well as faux boulder painting and wash techniques. Carrion appears to have mastered how to embrace the "mistakes" in his art and use them to enhance the whole. "Experience, technique, and strategic use of imperfections is what makes a Carrion piece so unique," said Andrew Hyder Gallery Curator. "I love to watch our collectors as they become immersed in his work." Carrion's work is now being represented and expanded into galleries throughout the southeastern United States. 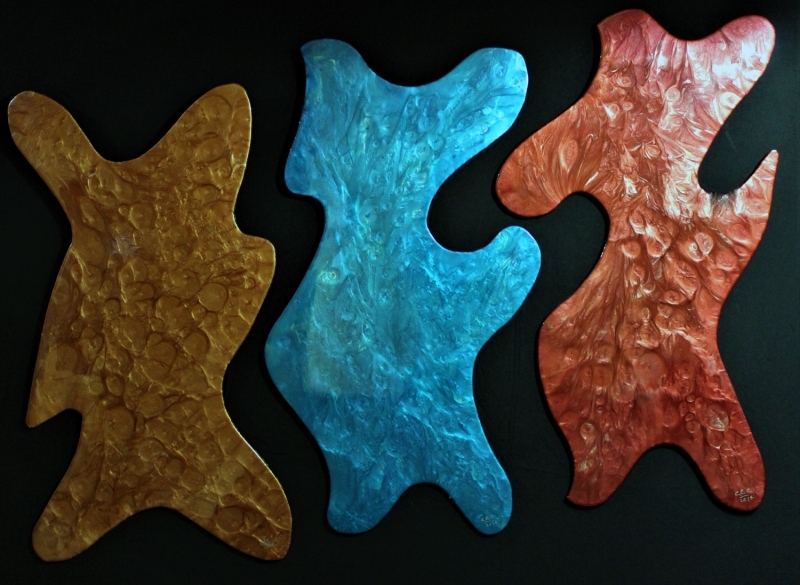 Metallic fusion epoxy painting puzzle, copper, blue, cheery. No frame a set of 3. You can have it all 3 put together or separate them. Height 36" x Width 20" x Depth 0.3"
I wanted something playful, whimsical, earthy. Clem E Carrion Professional Artist Clem E. Carrion is a unique visual artist originally from Bay Shore, Long Island, NY. Pioneering an acrylic epoxy morphing technique, he brings transparent glazing, surrealism, and contradicting textures together in beautiful one-of-a-kind works of art. Carrion's "paintings" achieve visual depth within multiple layers of translucent and transparent media that give the illusion of three dimensions. The luminescence and dramatic areas of color and light shown in the work often resonate with viewers. While living in Long Beach, California; Mayaguez, Puerto Rico; Miami, Florida; and now in Kissimmee, Florida, Carrion's work progressed to capture tropical expression without using traditional tropical themes. While traveling, Carrion took note of the colors, the ocean, the formation of rocks, their texture, and especially the various knots in indigenous wood grains. Carrion credits his father for his love for and talent in the arts. "My father loved to paint murals of idyllic and paradisaic scenes. His work left a lasting impression on me. I like to think this is where I got most of my talent," said Carrion. The various media used in his work also gets a lot of attention. Concrete, epoxy, metal infused paint, acrylic, wood, and other exotic materials seem to connect with collectors who invariably attempt to figure out how each piece was made. Carrion attempts to create movement or what he calls "Art in Motion" and what has been described as the "WOW" factor into each piece. Carrion attended mixed media school "Faux Effects" in Southeast Florida. The intensive training helped him craft his style and differentiate his work in the fine art space. He learned hue and color pallet techniques normally reserved for industrial applications. Through further training, Carrion perfected methods that allowed him to make concrete look like wood grain planks as well as faux boulder painting and wash techniques. Carrion appears to have mastered how to embrace the "mistakes" in his art and use them to enhance the whole. 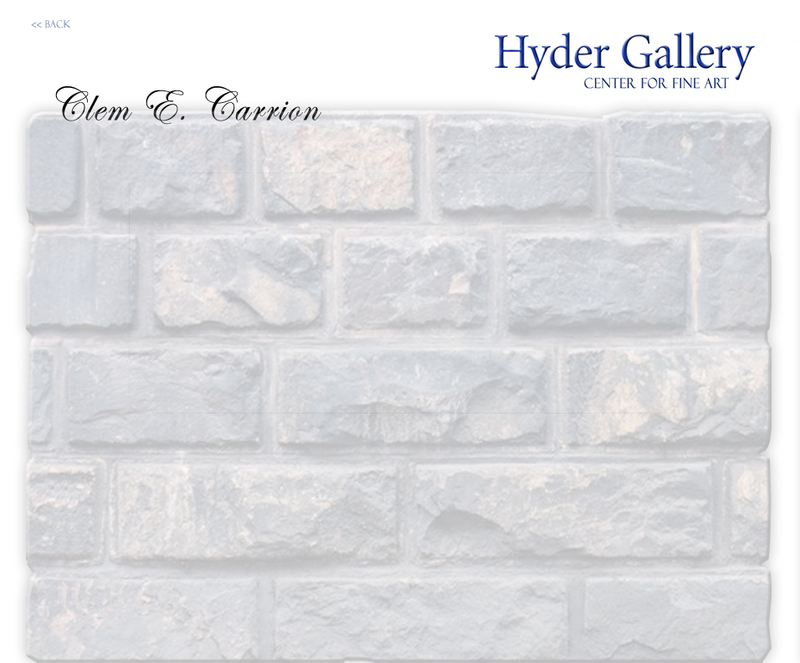 "Experience, technique, and strategic use of imperfections is what makes a Carrion piece so unique," said Andrew Hyder Gallery Curator. "I love to watch our collectors as they become immersed in his work." Carrion's work is now being represented and expanded into galleries throughout the southeastern United States.